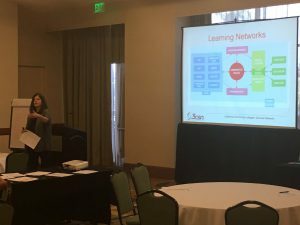 As part of this year’s Strengthening Student Success Conference at the Hyatt Regency Orange County (October 5-7, 2016), 3CSN conducted the post-conference session Lessons in Leadership: How a Networked Community of Practice Model Builds the Faculty and Staff Capacity Needed to Foster Institutional Transformation. Presenters Jeanne Costello, Mark Manasse, Anna Rogers, and Deborah Harrington were joined by Rose Asera from the RP Group. The interactive session introduced participants to the research base for 3CSN’s approach to community and capacity building, and key strategies for creating a cadre of community college professionals to seed, scale, and sustain high-impact student success practices. Participants practiced developing a theory of change, creating network maps that build engagement and ownership for implementation across their institutions, and planned the professional learning necessary to overcome resistance and cultivate a culture of innovation on their campuses.